a result of Sandzén's isolation in the American heartland and the limited spread of his influence within a regional rather than a national configuration." Lindsborg's Swedish American photographer Tom Jaderborg photographed so well the "marvelous, inimitable art"* of Sandzén for the 148 page 1993 book, Birger Sandzén, An Illustrated Biography, by former fourth Swedish American Bethany College president Dr. Emory Lindquist who summarized so well "his life and his art"* of this great Swedish and Swedish American pioneer artist; while Amherst, Harvard student and City University of New York American art historian and author of the renown 336 page 1984 book, American Impressionism, William H. Gerdts, gives us an eye opening introduction and analysis in Lindquist's "Foreword" of Sven Birger Sandzén's importance to "modernism," and where he fits into the American landscape of art in the 20th century! "Sandzén's Kansas landscapes naturally lack the spectacular scenery of his views of the Rockies and the Southwest, but they depart from the paintings of his contemporaries by emphasizing more broken features of the Kansas landscape. Working both in Graham County in northwestern Kansas and along the Smoky Valley just west of Lindsborg, he found and recorded in his thickly rendered, coloristic style the creeks and low cliffs that monumentalize the low-lying landscape, the colorful, varied riverbank vegetation, and the swaying trees that break the horizon on his scenes along Wild Horse Creek and Red Rock Canyon. Nina Stawski perceptively speculates that Sandzén was so attracted to the Smoky Hill River and Wildhorse Creek because he had come from a land where lakes and streams were abundant to a place where water was exceptional. But at the same time, the formations at these creek beds when dry in summer prepared him, in miniature, for the canyon and mountain forms he found in Colorado and the Southwest. "Sandzén was not alone among Kansas artists of the early 20th century in his respect for and devotion to the local scenery. The preferred subject matter of George Melville Stone was also the prairie landscape, though he was particularly concerned with it as a setting for farm activity – hence his appellation as the "Millet of the Prairies." 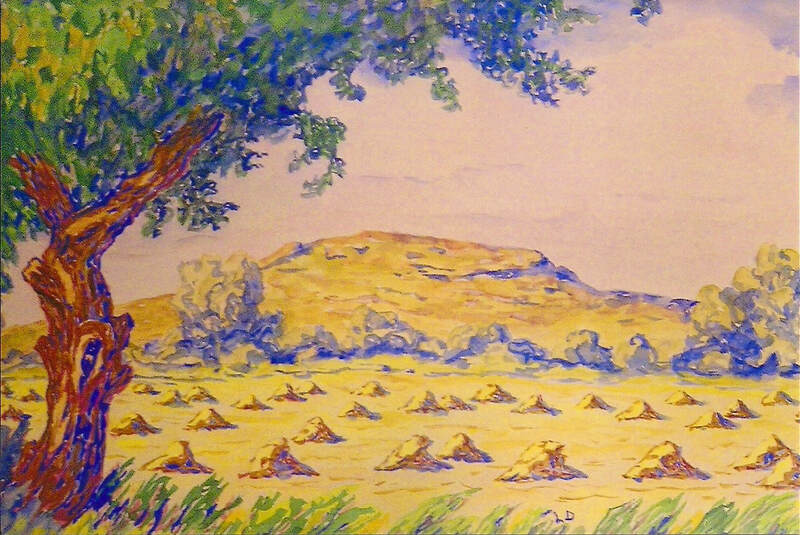 Sandzén, too, did not ignore such themes, as his Wheat Stacks, McPherson County attest (quite likely a homage to Claude Monet's Grain Stacks series, to some degree). And John Noble –" Wichita Bill" as he was nicknamed – carried with him during his expatriation in Paris and his later residency in New York City and Providencetown a sense of the endless sweep of the Kansas landscape, which served specifically as the setting for great herds of wild buffalo in his late masterwork, The Big Herd..."
"Sandzén's impact was felt by many students, those who studied with him in Lindsborg and those whom he instructed at other schools during the 1920s. Sandzén was unusual in that at these institutions he undoubtedly exerted greater influence on his pupils then the setting of those schools offered him. He was already a painter of the Rockies, and no perceptible change appears in his paintings during the Broadmoor Art Academy experiences during the summers of 1923 and 1924..."
"But Birger Sandzén's significance is greater than his role as an important influence on other artists or even upon the artistic and cultural development of his adopted Kansas, as detailed in Emory Lindquist's study. The artist should be recognized, I believe, as a significant figure in the development of modernism in America in the early decades of the twentieth century. He was a painter whose perceptions of the power and dynamics of color ally him with those other Americans who have rightly being recognized as leaders in the introduction of postimpressionism in America – artist such as Arthur Dove John Marin, Alfred Maurer, Marsden Hartley, Max Weber, and others. "Sandzén's paintings would have qualified in style and stature for inclusion in the major exhibition held in 1986 at the High Museum of Art in Atlanta, The Advent of Modernism. I suspect his omission was owing to the relative unfamiliarity of his painting, a result of Sandzén's isolation in the American heartland and the limited spread of his influence within a regional rather than a national configuration. His absence was an oversight at the time of the show, and it appears more so now that Emory Lindquist has define Sandzén so well, his life and his art. Ultimately, Sandzén's greatest and most enduring contribution is his marvelous, inimitable art." For more on Sandzén, from a 2010 "PBS Colorado Public Television Presents" piece on the then new documentary by producer Joshua Hassel of Denver titled Sandzén: "Ecstasy of Color," go HERE.